The work is possibly a preparatory study for what became The End of the Charge . . . at Rezonville. The uniforms of the combatants are identical to those in that painting and consistent with those of the units that participated in the battle of Rezonville. It provides a clue as to the color scheme of the lost painting. 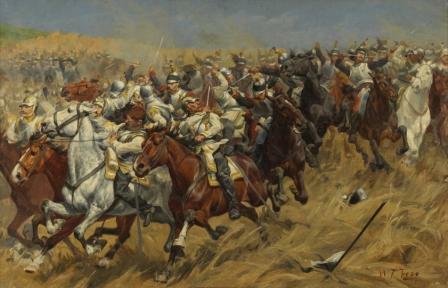 The Cavalry Sketch may have been inspired by Trego’s viewing of Aimée Morot’s 1886 painting Rezonville, 16 aout 1870, la charge des cuirassiers, which he had seen in the Luxembourg Museum in Paris. There are several similarities in composition, and the blond, heavily mustached soldier turning around in the saddle could be the twin of a prominent figure in Morot’s painting. The Cavalry Sketch can be partially seen hanging on the wall of Trego’s studio in a photo taken there in 1893. Philadelphia, 1909: Pennsylvania Academy of the Fine Arts. This was one of the four Trego paintings put on display at PAFA as a memorial to the artist shortly after his death.